Many potential teachers go into (and come out of) their experiences abroad with the incredibly false assumption that they are not a “real” teacher. This misconception is a direct result of two things: 1) not being required to have a degree in Education and 2) not always having a curriculum to follow. While it is true that a huge portion of employers value being a native speaker over all else, this doesn’t mean that you can approach your job with a completely lax attitude. Just because you speak English does not guarantee that you have any clue how to teach English. Doing this job adequately requires effort, planning, behavior management, patience, and the list could go on forever. No matter what you teach or where you do it, everyone can agree that teaching is one of the hardest jobs out there. Challenges will be present in the daily routine of both pre-K and university teachers, and they are only amplified when your students can’t understand half of what is coming out of your mouth. It’s not easy, and convincing yourself that you can skip through it like a cake walk without any effort at all will usually not get you very far. You are a real teacher: approach your TESOL job as such. As stated above, some people might believe you are only a real teacher if you have a teaching degree. In the ESL world, this isn’t the case. While some employers in various countries will prefer or even require it, don’t be discouraged if you studied anything else. A degree in any subject will be valuable to your employers because, in their eyes, it shows that you value education, which is a huge component of being a successful teacher. The requirements for teaching overseas vary widely, but as long as you are flexible with your location, you will certainly be able to find something. Earning a TESOL certification will only increase your odds. Plus, these courses offer invaluable instruction and tips that will come in handy for those who lack a formal education in educating. -Read: Get Paid Teaching Jobs Abroad! Sorry, friends, but this is not the case. Think back to when you were at school. While some of us loved it, we can all agree that there were subjects that you just didn’t care about- the ones where you stared blankly off into space as the teacher rambled on, seemingly in a foreign language. Well, in this situation, you are speaking a foreign language, and it’s difficult for the students, many of whom will never hear it outside of your classroom. Adults may sign up for classes on their own, understanding and accepting that having that added skill will allow them to advance professionally, but most kids won’t. In many countries, your job will be at a language institute, not a public day school, meaning that you will be teaching students during time that otherwise would have been free for them. Many young students will be coming to you after already spending a full day at regular school, and having yet another lesson from someone they don’t understand can obviously be emotionally and physically draining at the end of the day. While you can do you absolute best to motivate students, make class fun, and try to get them stoked about coming to class, you can’t always get through to everyone. Some just won’t want to be there, and you can’t take this to heart. The key is to accept this now to avoid future stress or heartbreak. 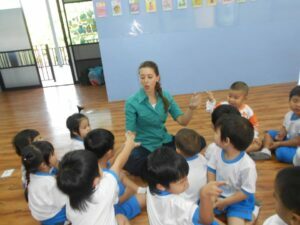 Although primary schools are definitely one of the main markets for English teachers abroad, especially in countries where English instruction is a compulsory part of the curriculum, teaching ESL doesn’t necessarily mean you must teach children. There are plenty of universities, language institutes, and businesses that are desperate for English teachers and will not require you to sing songs, deal with tantrums, and sort out crises over toys. However, you should keep in mind that the older the student, the higher the standard (usually). In most countries, these higher level positions are reserved for qualified teachers with several years of experience and an advanced TESOL diploma or certificate.